Go to “Data source settings” block and click “Add new”. Select user directory as a data source. Define name of user directory, enter site url. 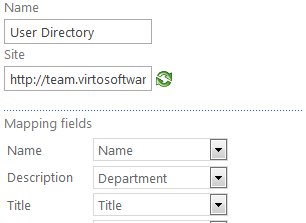 Now match fields of facet categories and user directory fields in “Mapping fields” block. Note: “Name” field is required. Then you need do define image settings for Pivot View. Define width and height of images (in pixels). Note: page load time depends on image size. Do not define too large size for images in the Pivot View. Then go to image settings block and define parameters of displayed images. The settings can be customized in the same way as it is described in “SharePoint list” chapter.